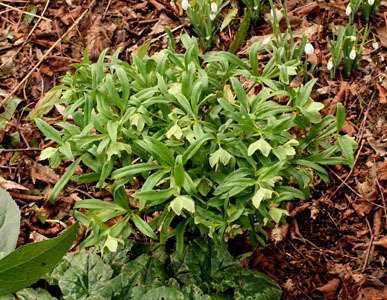 It is a fact that Helleborus dumetorum is not seen in many gardens. 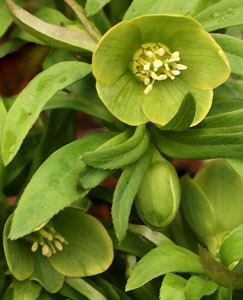 It is one of a number of species Hellebores which, having donated its genes to its more glamorous hybrid relatives has thereafter taken something of a back seat. This is a bit of a shame because it is a very distinctive member of the genus which is instantly recognisable and, at least by enthusiasts, is often described in the literature as 'demure', 'elegant', or even 'delicate'. It is also a very stable species in terms of its taxonomy, having never suffered a label change since the early nineteenth century, this in a genus which is well known for its nomenclatural controversy. In Europe its distribution remains relatively local, with colonies scattered over parts of what are currently Austria, Hungary, Romania, Slovenia, and Croatia. In its native habitats it is said to favour damp lightly shaded woodlands which have a humus rich but not waterlogged soil and it is very much at home where similar conditions can be provided in the garden. It is completely deciduous, having totally disappeared by Autumn only to suddenly re-appear with me in mid-January, rapidly extending its leafy bracts which always threaten to obscure its small green flowers. At this stage it does indeed appear to be the most tender of Hellebores but is, in fact, bone hardy. In our garden, during the winter of 2009/10, it was frequently inundated by snow when in full leaf but easily survived everything that was thrown at it. As a garden plant it certainly doesn't possess the glamour of all those H. x hybridus cultivars but nevertheless makes a welcome contribution to the late Winter garden and provides the ideal foil for other early flowering genera such as Galanthus, Eranthis, Corydalis, Fritillaria and Anemone. 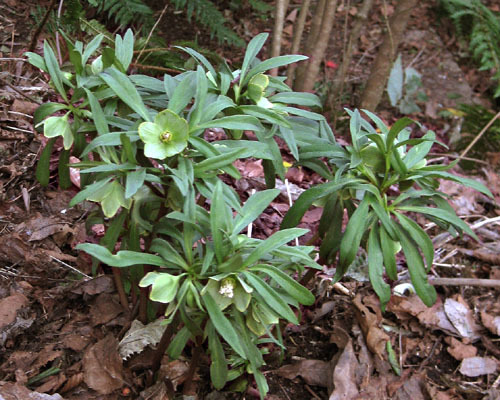 And what's more, with this particular Hellebore there is no need to debate whether or not to remove overwintering leaves .... there simply aren't any!